The International Space Station is a very safe working environment, as I explained elsewhere. However, the fact of being in space does make some situations quite critical and potentially life-threatening, therefore crewmembers practice extensively the proper response to such emergency scenarios. 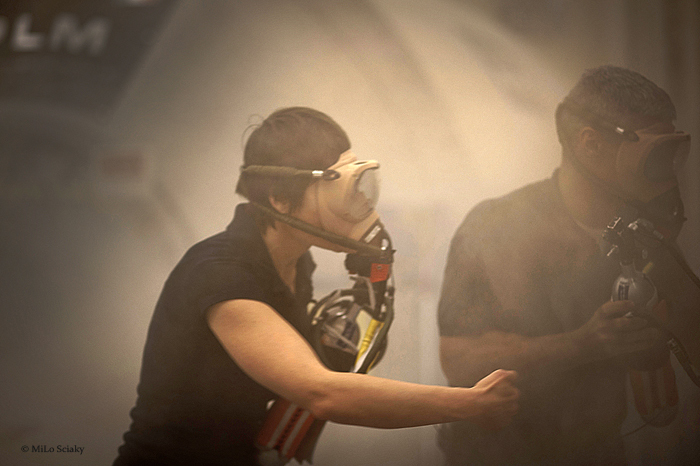 Here’s the story of one emergency simulation: fire on-board! I have been instructed to take my place in Columbus, the European Lab on ISS. My two crewmates for today, Nemo and Mark, have been directed to the US Lab and to the Service Module respectively. I’m adjusting my spymic, which allows the instructors sitting outside to hear what I say. This is always a bit of an awkward moment: you just need to wait for the emergency tone to go off. You know it will go off and there is nothing to do until it does. Except… well, noticing smoke coming out from behind rack panels in Node2, your neighbouring module. That’s a scenario when the smoke detectors did not set off the alarm but the crew notices smoke. Nemo sees it before I do and he manually annunciates the fire emergency by pressing the fire button on a Caution & Warning panel. As soon as he does so, all speakers on Station immediately start to transmit the familiar, intermittent emergency tone. Simultaneously, the fire auto-response is initiated. All intermodule ventilation fans are shut down and intermodule ventilation valves are closed, interrupting all forced transfer of air between modules. Since no smoke detector picked up the fire yet, the cabin fans are left running: this way the air inside each module is still circulated and eventually the smoke will hit a smoke detector and the vehicle will know where the fire is. At that point, cabin fans will be shut down as well. Starved of fresh oxygen, a fire will hopefully be soon extinguished. But we can’t just count on that. As soon as the emergency is annunciated, we all start to make our way to the Service Modules, or the SM as we like to call it. For most situations, the SM is the safe haven of choice. It’s located in the Russian segment, where the Soyuz are docked, thus most likely guaranteeing a free path to the escape vehicles. Both Russian and US commanding laptops are always up and running in the SM and its audio terminals allow to setup communication with both Mission Control Houston and Mission Control Moscow. On my way to the SM from Columbus I have to pass the area of visible smoke in Node 2. Since you can never know how toxic combustion products are, I’m required to wear an oxygen mask. I grab one in Columbus: the attached bottle contains an oxygen supply for about 7 minutes. I also turn a selector knob to the emergency position. This setting creates a positive oxygen pressure inside the mask, so that no contaminated air can flow in from the cabin. In real life of course. This is just a training sim and there is no real flow of oxygen! Nemo is waiting for me. We lower the hatch between Node 2 and the Lab and we head together to the SM, briefly stopping in Node 1 to pick up two portable analysers of combustion products. We find Mark back in the SM. He has already closed, but not latched, the Soyuz hatches – a precautionary measure to preserve the air inside the escape vehicles. He has also set up emergency coms, reconfiguring the loops so that the US and Russian space-to-ground channels are interconnected. Finally, he’s already taken an atmosphere reading. The air in the SM is safe to breath. I doff my oxygen mask. Nemo, who is the ISS Commander for this scenario, makes a call to Mission Control to report on our status: we’re all in the SM, we’re doing well, the air is safe to breath, we’ve used one oxygen mask and we’re working the procedure for visible smoke in the cabin. There’s no answer today. Instructors want to put us in the worst case scenario of responding on our own. In real life, I guess Mission Control would be more helpful! What comes next is basically the hunt for the fire. Nemo and I could not see any evident smoke source in the Node 2 cabin. It means that the fire is behind a rack panel. We split into two teams. Nemo will remain in the Service Module and be our laptop operator. He will look for tripped electrical switches and failed equipment, all good clues as to where the fire might be, and pass on information to us. Mark and I are the forward response team and we make our way back to Node 2 carrying with us fire respirators: we don them in the Lab, prior to entering the area of visible smoke. Of course it’s not real smoke and there is no real fire. As Nemo transmits to us suspect rack locations based on his findings on the laptop, we stick the probe of our analyser through the corresponding fire ports to sample behind the rack panel and look at the monitoring instructors to tell us what reading we should assume. Finally, we are given a carbon monoxide reading which is high enough to confirm the fire location. Nemo proceeds to unpower all the equipment in that area and, since we’re told the readings indicate ongoing fire, he continues with the power-down of the entire module. Now, because it’s a really bad day, even that doesn’t do the trick. To no one’s surprise, instructors tell us that carbon monoxide readings from our analyser are still rising. That forces Mark and I to turn to the ultimate weapon: the fire extinguisher. As we fully discharge one extinguisher through the fire port, the entire partition behind the panel is filled with CO2, completely displacing any remaining oxygen that might have still been feeding the fire. Now, that should really be the end of it! Mark and I close the hatch of Node 2 after gathering some essential equipment. In real life, Mission Control would pick up from here and come up with a plan to cleaning up the mess. In the meantime, since crew quarters are in Node 2, we would have to do without our toothbrush. Thank you so much. I am new to following the going ons of astronauts and I am very much enjoying learning and seeing everything related. Here’s my question: how do you communicate inside the station during a fire? Does the station have intercoms? Walkie Talkies? How do you normally communicate with people in other nodes on a normal day? thanks for your interest. The Station has audio terminal panels in almost every module. Typically they will have a portable mic plugged in and you’ll listen on the speakers, although you can also wear a mic/headset combo. Depending on what channel your audio terminal “talking”on, what you say might go on space-to-ground to mission control or just on the Station intercom channel. Thanks! Good luck in your training. I can’t wait to follow you on your journey into space! Ho letto quello che hai messo . mi sono sempre chiesto se succedeva un incendio sulla ISS cosa si sarebbe innescato per bloccarlo. Avevo pensato anche ad un congegno che imprigionasse l’anidride carbonica conpressa scartata dalla stazione in un serbatoio per utilizzarla come soffocatore di fiamme visto che ovviamente l’acqua è impossibile utilizzarla. Cmq ti seguo sempre e ti faccio i mie complimenti. grazie! Nel segmento russo della Stazione Spaziale in effetti si utilizzerebbero estintori ad acqua (o meglio a schiuma). Ma il sistema elettrico lì è a voltaggio molto più basso. One more thanks for this article! I’d have one question: let’s imagine a catastrophic scenario where the fire just spreads out everywhere and is impossible to control. Would you be able to close a module enough and isolate it from the rest of the station? 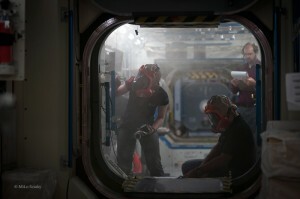 Would you be able to go back to the Soyuz and abandon the station? you can of course think of any number of catastrophic scenarios that would kill the crew. But in reality they are EXTREMELY unlikely. As mentioned, the vehicle’s auto-response is designed to cut the oxygen supply to any fire and most things on station are non-flammable. Thank you very much for your answer! It’s good to know the risks are actually very low. I’d have to check with you here. Which is not something I usually do! I enjoy reading a post that may make people today feel. Also, thanks for allowing me to comment! Thanks for your interest and your positive feedback! Excelente su entrenamiento Teniente. Como se siente usted representando a miles de pilotos que quisieramos estar en su lugar ? Se da cuenta que tiene un apoyo mundial ? Saludos desde America del Sur .